There is a reason why Saffron is so expensive. 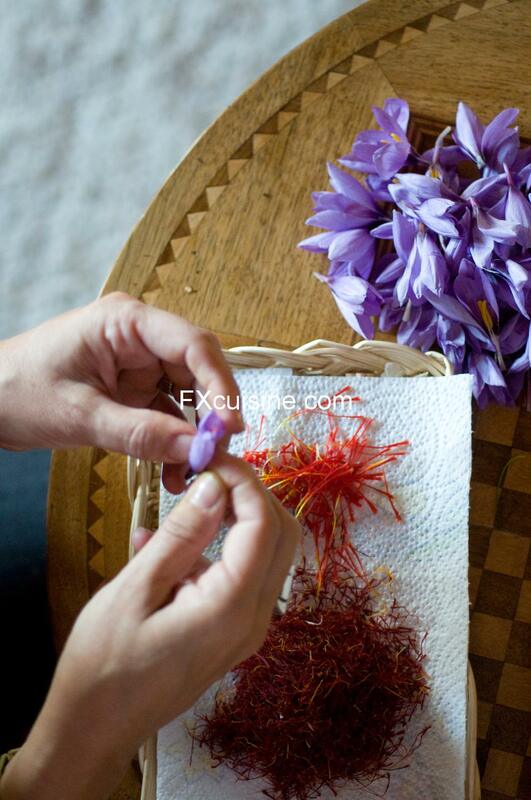 Harvesting Saffron is no easy task. You get a little glimpse of it in the picture above taken by fellow blogger François-Xavier of FX Cuisine. I absolutely adore his blog and I am very sad that he doesn’t blog as often as he used to. If you get a chance please go over and read about his adventure harvesting Saffron in Switzerland!! 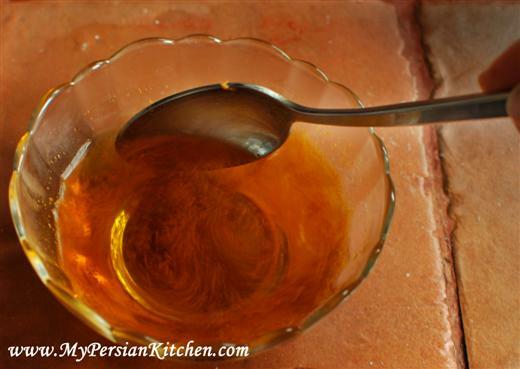 This is how Persians usually prepare and use saffron in food. You have seen me do this before in pictures, but here is the step by step process. This is all you need a mortar along with hot water. 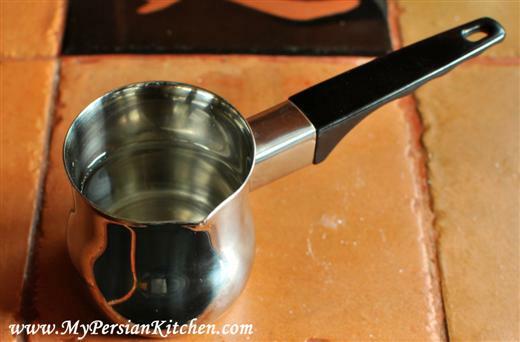 I love this little little stainless steel Turkish coffee maker pot because I can use it to quickly boil up a small amount of water for my saffron without having to use my kettle or a sauce pan. 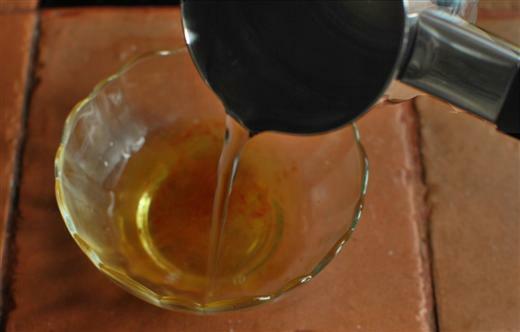 In a mortar grind a pinch of saffron with a pinch of salt or sugar. The addition of salt or sugar will make the process easier. 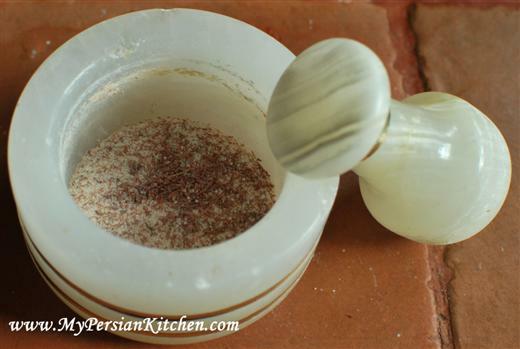 Place ground saffron in a small bowl and pour hot water over it. Make sure that you always use hot water as it helps release the aroma and works much better than room temperature water. Stir well. Now you are ready to use the saffron in your recipe as needed. If you don’t want to bother with having to grind the saffron every time you use it, here are a couple of shortcut options. 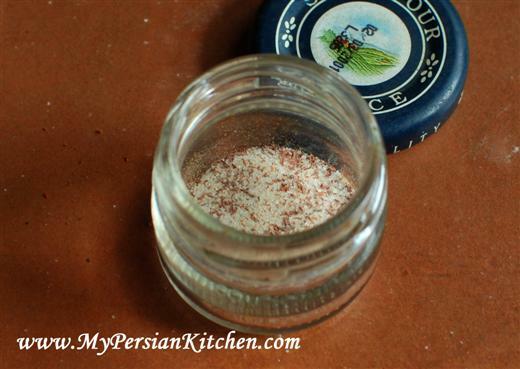 Place ground saffron in a small spice bottle. Add hot water to it and close the lid. Give it a nice shake. Open the lid and let cool down to room temperature. Store bottle in the fridge and use as needed. Alternatively, you can store your ground saffron in a small jar. I was given this jar by one of my aunts which came filled with ground saffron! I keep on reusing it as it is nice and small. So there you have it! A couple of nice shortcuts to save time while cooking! What a lovely post. I love saffron. I also love your blog! My boyfriend is Persian, I am learning to cook for him and your blog is very informative, interesting, and helpful. Thank you for your kind words La! Please do share your adventures in the kitchen while making Persian food! I put my ground saffron in a small salt shaker. I don’t use a mortar and pestle, but instead I bought a small coffee grinder used specifically for my saffron. The coffee grinder does a good job in no time at all. That’s a good idea Joon! i use the coffee grinder too. 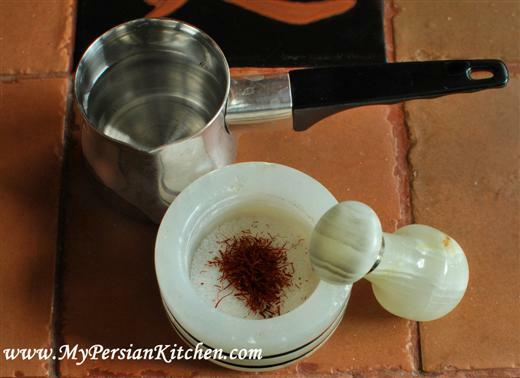 but what i do after i pour the hot water on saffron is that i steam it ( dam Kardan) , it helps to bring out the color. I love the similarities between Persian and Indian food/ingredients. I love saffron! Thanks for the tips! 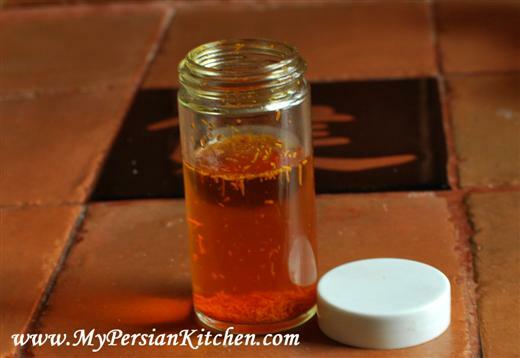 @ Maryam: How do you steam your saffron? @ Indian cook in NY: we do indeed have some similarities. I love Indian food and the way the same spices are used differently! Ok. I put the grinded saffron in a glass bottle, pour the hot water on it , close the lid, then place it on top of your kettle , where you normally place the tea-pot, for at least 10 minutes. This helps to bring out the color more. I am going to have to try your way! ASAP! thanks for the saffron tips. It’s so precious, so using it in a way that brings out the best of it is so important. 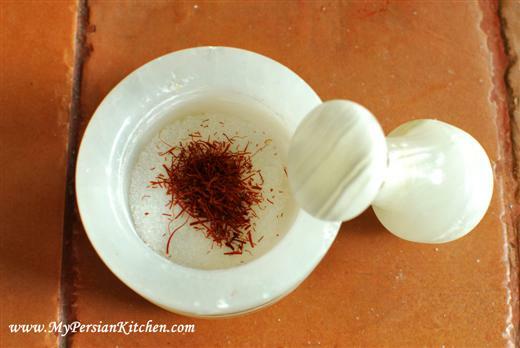 Saffron is indeed the jewel of Persian cuisine. It’s like gold, diamonds, platinum, and all of the gemstones of the planet wrapped into one. Love the color and flavor. I have some saffron somewhere that dates to the 1980s. Believe it or not, if I’m out of the fresher saffron and have to use some of the old stuff, it actually still has a pretty strong flavor. Where can you get reasonably priced saffron in LA? Steve, you can find Saffron at Persian Markets throughout Los Angeles. You can also find Spanish Saffron at Trader Joe’s. You are so sweet Shayma, thank you for your kind words! 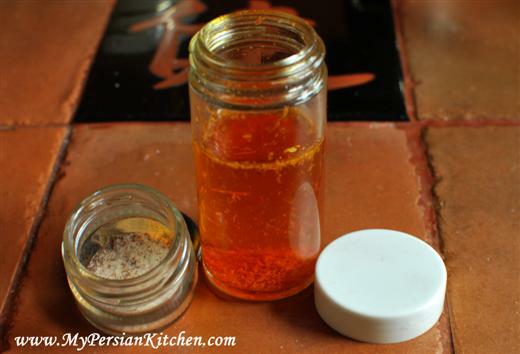 Saffron is definitely versatile and I love seeing how non-Iranians use it in their cuisine. I try to keep it real around here, I try to show the good, the bad, and the ugly!!! You are an artist. You’re really good. Love the way you explain and present your work. I have not tried them yet, but I am sure I’ll give it a go. A real source of inspiration. Keep up the good work. PS: I’ll start with khoroshte fesenjoon and invite my danish friends. Reza jan, thank you for your kind words! You just made my day! I say go for it and cook away! Can you use saffron or tumeric when creating a dry rub for a beef brisket??? Alma, you can, but I wouldn’t go over board with either one of them. If you use too much turmeric it will give a bitter taste to your dish. I really like persian food and especially the fact that they use so much saffron or Kesar as we indians call it! There are alot of similarities! I was just wondering where you got your mortor and pestle from? It is perfect for saffron! Pritesh, thank you for your comment. My mortar and pestle was a gift. I think it was originally purchased in Iran. Salam alaikum, Perfect made with white sugar to use in your, Sunshine Chicken & Zereshk Polow ~ Rice with Barberries. I will use this again and again!!! I’m just getting started on Persian cooking. The more I read your posts, the more I want to try out! A quick question about saffron. In your recipes, when you mention 1 T of saffron dissolved in water, is that 1T of the hot water with a pinch of saffron dissolved in it? I was reading it as 1T of saffron which is then dissolved in water, and that’s A LOT of saffron. Rachel, what I mean is 1 tablespoon of hot water with saffron dissolved in it! As you can see I use a pinch of saffron and mix it with a few tablespoons of water. Thanks so much for posting. I really needed to see this, step-by-step! I’m very glad that I read through the other posts so as not to ask the same question about the saffron/water ratio. And now, thanks to this wonderful blog about saffron, I know that I can make more of the saffron water and keep it in the fridge. How long will it keep there? My friend, Payam, is from Iran and he has taught me so very much about Persian cooking. Since I’ve always loved to cook, I’ve learned quickly. Your website and step-by-step recipes with pictures have helped me immensely… thank you!! Payam wants me to tackle Ab-Goosht next, and said your recipe is perfect, so tomorrow I’ll be in the kitchen again. I was trying to make Saffron with hot water, but don’t know how much water to add. As you mentioned a pinch of saffron, a pinch of salt or sugar, my guess is 1 pinch is equal to 1 tbsp? how much hot water I need to add? Thanks for your recipes . Love your site. Thanks again! Mindy, 1 pinch is closer to 1 teaspoon. I would say 1/4 cup of water to half a cup. I’m American and marrying a great Persian boy, as well as his wonderful Persian family. Reading your blog is like sitting in my future mother-in-law’s kitchen! I read this post to see if you did it differently than she does…but nope! I love your posts. It helps me sound like I know what I’m talking about with the new family. haha. Rita, dive right in and start cooking!!! I am so glad that I found your website! My best friend moved back to London and she was the only person I knew who could cook Persian food. Having been raised in Iran, she cooked all of the dishes with her eyes shut. I am appreciative that you are willing to share the secrets of this amazing cuisine with the world! Thank You! PS. I am bookmarking your site! Mehdi, we usually don’t use coffee grinders for saffron. The best way is to use a mortar and pestle as seen in my pictures. Check Costco also. Costco Canada stocks Spanish saffron in its Vancouver-area stores. It’s a steal at roughly $15 CAD a gram (about 0.35 oz.). I haven’t been in a U.S. Costco in nearly 3 years, so I can’t guarantee they’re selling it. It’s worth checking out if you’re a Costco member. This is La Mancha saffron, said to be the best from Spain. 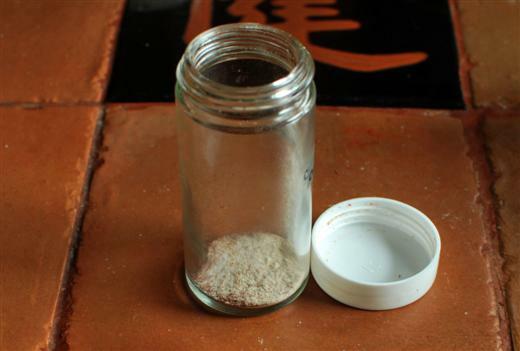 It is of very high quality; almost all threads in the jar have a very deep color. I made saffron water last night for zereshk polow and I was wondering how long the saffron water keeps in the fridge? Thanks and the polow tasted great! Love your website and recipes. I have a question about making the saffron water. How long will it last? Can I make a big bottle of it? Or do I have to make sure that I use it up in a week? Also, once the saffron water is made, should I keep it in the fridge or not? Reshimi, I suggest making it in small quantities and use it with in a week. Rosanna, I would keep it one week max. I have a question: how long can you store the brewed saffron in your refrigerator? A week or f o r e v e r? Margaret, about a week or so. If you Google pinch and dash you will see they are actual measures in English like ounce and cup. Think more like an eighth teaspoon, the amount you could pinch between you thumb and finger. Other small amount is a smidgen sometimes called a smidge. So, someone above said that Spanish Saffron is the best. . .Certainly, the Spanish saffron growers would like you to think so. Actually, the best probably grows in Kashmir, but given the geopolitics of the region, we don’t see much of that. The best is arguably Iranian, but sanctions have made it tough to get. In LA you can certainly find it in a Persian grocery. I buy my Sar Gol saffron from http://www.safffron.com. He used to sell Iranian, but now sells Afghan saffron from Herat. At the time I write this, it sells for $79.95 an ounce. This is very reasonable. I think what is happening is that many Iranian farmers/businessmen have moved to Herat to grow their Saffron, thereby getting around the sanctions. Or, they are repackaging Iranian saffron as Afghan. Either way, the quality is exceptional! Mypersiankitchen are u from iran? I have a comment :if u stew saffron after mortar grind you give better than result! that color and aroma is more than befor.u most pouring it on the pot and put an the steam about 1 hour. How much water do you use for how much saffron? Mussy, it depends how much saffron you want to make. I usually do about a pinch of saffron and 1/3 cup of water.